This is an annual exhibition, produced by the Barbados Agricultural Society and partnered by the Ministry of Agriculture and Rural Development. 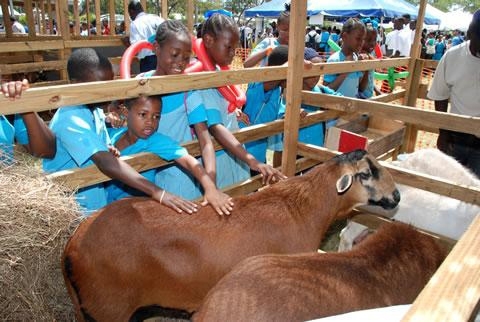 Each year Agrofest attracts over 6,000 local and international patrons presenting them with a unique opportunity to experience all the facets of Barbados’ agricultural sector in a relaxed and comfortable environment. Agrofest brings together vegetable and fruit farmers, livestock farmers, fishermen, as well as persons involved in horticulture and other areas and allows them to showcase a variety of high quality local products. Some Featured Exhibits/Shows/Events include: * The popular Sheep Show * Dairy & Beef Show * Adorable Dog Show * The BHS Flower exhibit * Petting Zoo * Caribbean Cuisine * Farmer’s Market * Shopping Bazaar * Educational Area * Children Entertainment Area * Donkey Rides * Art & Craft Village * Live entertainment through out the weekend * Mounted Police Tattoo Visitors to Barbados are welcome to experience first hand the very best of Barbadian Culture, Craft and Cuisine. This is a day out that the whole family can enjoy!